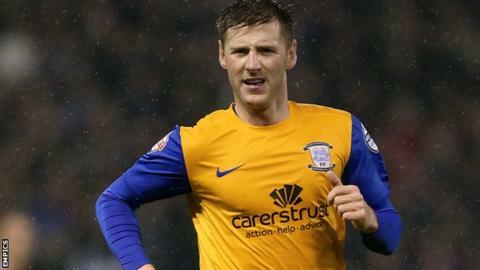 Preston maintained their good form with a win over Gillingham in League One. The hosts took an early lead when John Welsh's shot found the top corner after Stuart Beavon's lay-off. But the Gills drew level on the stroke of half-time after Jack King miscued a headed clearance and Leon Legge fed Cody McDonald who fired home. Paul Gallagher regained the lead with a shot from the edge of the area before Neil Kilkenny sealed the win from close range with his first touch. "The players have worked exceptionally hard. I know we got beat today but we played against a very good team. The main objective was to stay in the division, start again and learn from the season. "In the end, the club didn't have a particularly good start - so to finish off with 52 points, I think we've all got to be pleased with that. "I'm just really, really pleased we're still in the division because there was one or two times where I thought this is going to be very close - but we're over the moon now." Match ends, Preston North End 3, Gillingham 1. Second Half ends, Preston North End 3, Gillingham 1. Jack King (Preston North End) wins a free kick in the attacking half. Foul by Adebayo Akinfenwa (Gillingham). Attempt blocked. Neil Kilkenny (Preston North End) right footed shot from outside the box is blocked. Attempt blocked. John Welsh (Preston North End) right footed shot from outside the box is blocked. Foul by Connor Smith (Gillingham). Attempt missed. Chris Humphrey (Preston North End) right footed shot from the right side of the six yard box is close, but misses to the right. Neil Kilkenny (Preston North End) wins a free kick in the defensive half. Attempt blocked. Craig Davies (Preston North End) right footed shot from outside the box is blocked. Attempt missed. Adebayo Akinfenwa (Gillingham) header from very close range is close, but misses to the left. Corner, Gillingham. Conceded by Jack King. Attempt saved. Paul Gallagher (Preston North End) right footed shot from the left side of the box is saved in the bottom right corner. Attempt missed. Adebayo Akinfenwa (Gillingham) header from a difficult angle on the left is just a bit too high. Substitution, Gillingham. Bradley Dack replaces Jake Hessenthaler. Adebayo Akinfenwa (Gillingham) wins a free kick in the defensive half. Attempt blocked. Craig Davies (Preston North End) right footed shot from the centre of the box is blocked. Corner, Preston North End. Conceded by Joe Martin. Substitution, Preston North End. Craig Davies replaces Joe Garner. Leon Legge (Gillingham) wins a free kick in the defensive half. Attempt saved. Paul Gallagher (Preston North End) right footed shot from outside the box is saved in the top left corner. Corner, Preston North End. Conceded by Myles Weston. Substitution, Gillingham. Adebayo Akinfenwa replaces Charlie Lee. Foul by Neil Kilkenny (Preston North End). Jake Hessenthaler (Gillingham) wins a free kick in the defensive half. Attempt blocked. Joe Garner (Preston North End) right footed shot from outside the box is blocked. Joe Garner (Preston North End) wins a free kick on the right wing. Hand ball by Joe Garner (Preston North End). Steven Gregory (Gillingham) wins a free kick in the attacking half. Myles Weston (Gillingham) wins a free kick on the right wing. Foul by Scott Laird (Preston North End).